Wizard battles in many settings are like stereotypical gunfights in the old west – a moment’s twitch of the fingers, a flare of fire and smoke and pain, and a dead body on the ground. In games such as Dungeons and Dragons, the casting time of incantation is in the order of seconds. Magic is often immediate, and visceral, and brutally effective – a tool of battle and conquest, and rarely something of intricate, inherent merit. Not so in Seasons. In Seasons, magic is an art-form, and the greatest artist gets to proclaim themselves the Archmage of Xidit. That’s me. I’m kind of a big deal. Seasons is a game that is bursting with a primal vibrancy – it’s an assault of primary colours and alchemical symbolism. It has large, totemic dice surrounding a disc inscribed with exotic runes. It’s a visual treat that morphs into a tactile thrill. This is a game that feels portentous. As spellcasters in Seasons, we have a somewhat more epic scope than is common in competitive battles of wizardry. In this, it owes a lot to the sedate traditions of Hermetic mysticism rather than the more utilitarian tradition of Vancian magic that permeates many role playing systems. The magic in Seasons is slow and ponderous, with wizards gathering in a place of sacred magic and invoking spells and effects that take months to come to fruition. Seasons is played over three years of game time, and careful preparation, not the chanting of deadly machine-gun syllables, is the key to success. That preparation takes places on several levels. Part is in the gathering of special alchemical tokens, each representing the fundamental forces of air, earth, fire and water. Part is in the procurement of powerful magical items and summoned familiars, each of which come with powers and abilities we can bend to our will. Some of it is in the distribution of our starting hand of cards into the three grimoires we’ll unlock as the years go on. And much of it is handled in the initial draft, in which each magi chooses the nine cards that will form their starting hand. This is a moment of power – careful selection of cards will have a deeply predictive impact on your likely success. However, you can only pick one card and then pass the remains on – every card you pick is at the cost of another. It’s tense, and exciting, and meaningful. Your success in the draft will be an accelerant on your ambitions. Your mistakes will haunt you for the course of the game. I mean, just look at these cards. Every one of them has value. Do you want to control the passage of time itself? Those temporal boots would be outstanding in that capacity. Or perhaps you want to hobble an opponent by striking at their base of power? The Demon of Argos would be ideal. You can have one, but at the risk of forever forfeiting the other. That hand would go well with the boots too. Perhaps you want to focus on constructing your own engine of magical effectiveness, creating a thrumming, intricate web of interactive thaumaturgical tensions. Perhaps you want to be an efficient, prudent spellcaster, abhorring waste? You’ll want the hand of fortune then. Or perhaps you want your opponents to enrich you each time they progress their own agenda? The thieving fairies might be good there, although their effectiveness will be dependent on the way your opponents will be playing. Seasons isn’t just a game of planning and engine-building – it’s a game of observation and forward thinking. The initial draft gives you a total of nine cards, and you’ll partition these up into three grimoires. The first you get instantly – grimoires two and three you’ll get as you enter the appropriate year of the contest. Part of an effective draft is planning for the future as well as the present. It’s all fine and well to focus on the cards that will ramp up your engine but you’re going to also need to direct all that energy somewhere productive as time goes by. 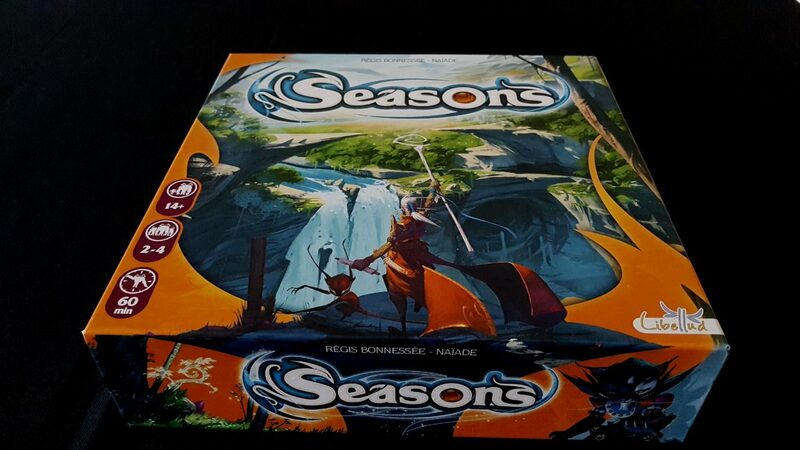 Seasons, as its name implies, is a game where you need to pace yourself. Your engine you see is driving your ability to summon the cards you’ve picked. For that, you’ll need raw magical fuel – energy tokens. Each card has a summoning cost, and you’ll need to pay that before you can conjure it into existence. And more than that, each card requires you to have the necessary summoning power to keep it in front of you. 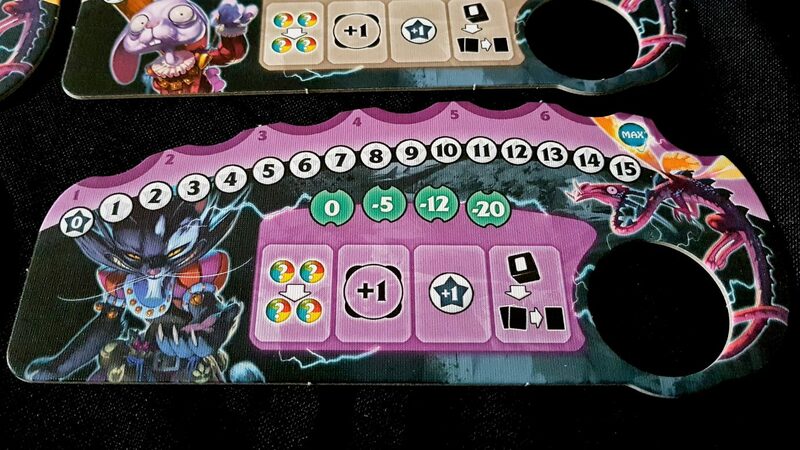 That’s determined by your player board, which is the tome you use to track your growing abilities and resources as the contest progresses. This sets both the expanses and limits of your power – it contains seven sockets for energy tokens, and barring special cards we can’t ever hold more than that in reserve. Everyone begins with a summoning power of zero, meaning they can’t even bring a single card into play. The first priority of a wizard must be to increase their summoning power to the point that they can leverage these powerful cards they have procured. And then they need to keep increasing that summoning power to bring the rest of their cards into play. 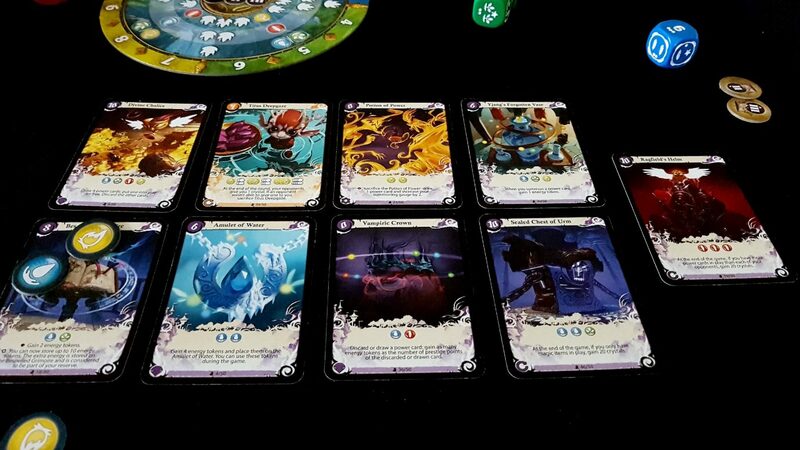 All the while they need to be gathering the energy tokens that will let them actually play the cards in front of them. Some cards will boost summoning, or award energy tokens, but you need to get at least one of them to the table first. If you have them. So how do you get tokens and summoning power? You get them from those lovely dice that surround the Seasons game tracker. These are huge, hefty beasts – heavy with the authority inscribed upon their faces. 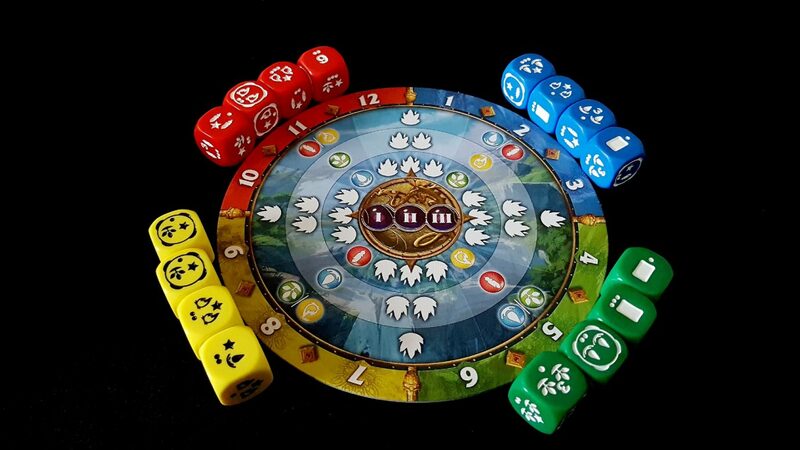 The Seasons dice are powerful – they drive the entire tempo of the game in interesting and subtle ways. And they’re all different – even within a given season, each dice has its own subtleties. 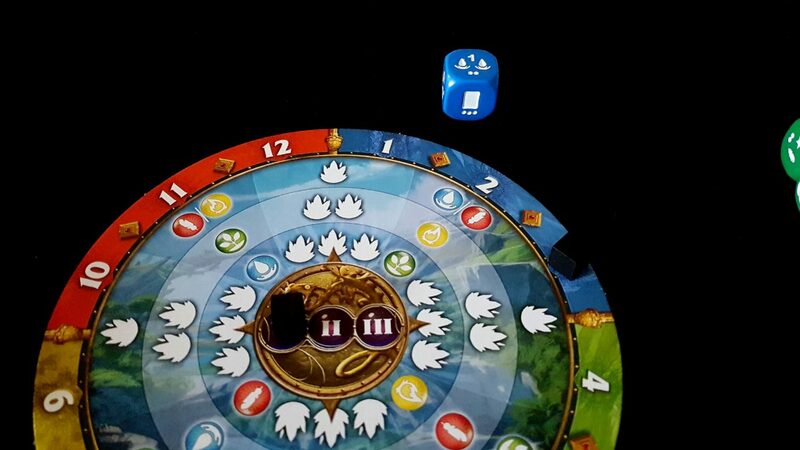 The dice you put around the disc will alter the way the game itself plays. Look at those things! They look like forbidden relics from a raid on Merlin’s house. Every turn, the current player will roll these dice (one for each player, plus another one) and then they are selected in draft form by each wizard in turn. 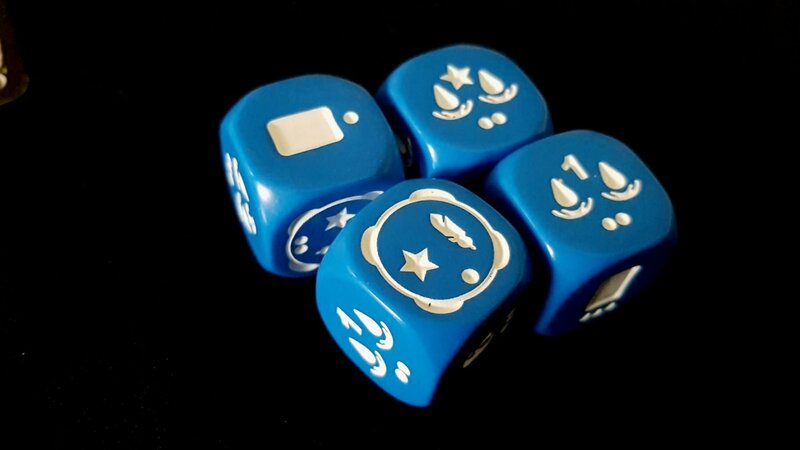 Then, wizards execute the instructions upon the dice, and turn these eldritch symbols into gameplay fuel. The rectangle for example means ‘draw a power card’ – you can use that to extend your hand to include new cards that weren’t available in the draft. The star is a point of summoning power – if your die has a star on it, you get to move your gauge up by one. The number indicates a quantity of crystals, and these are the currency of victory. The player at the end with the largest number of crystals wins. 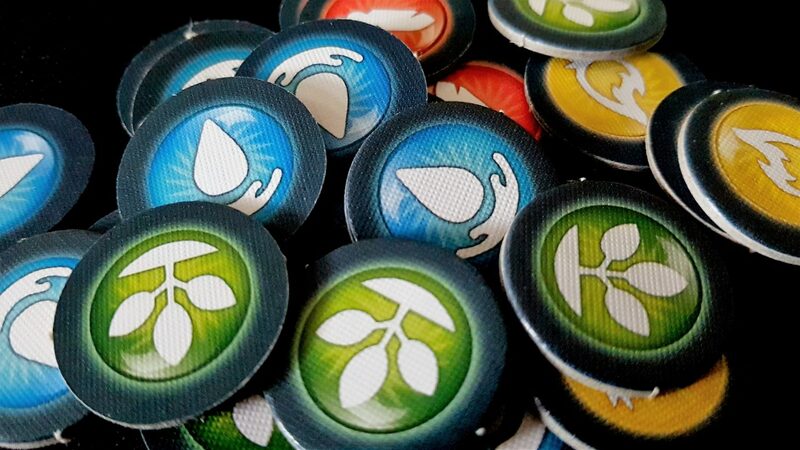 The droplets represent water energy tokens, and the leaves represent air energy tokens. The strange encirclement represents a transmutation, which lets you turn tokens into crystals at an exchange rate determined by the current season. Those crystals are score, but they’re also occasionally a currency. While the lion’s share of your scoring occurs at the end of the game, you’ll want a healthy reserve of crystals on the track to make sure you can take advantage of the opportunities the years may present. That die gives us a point of summoning, which lets us move our summoning power to one – enough to summon a single card. 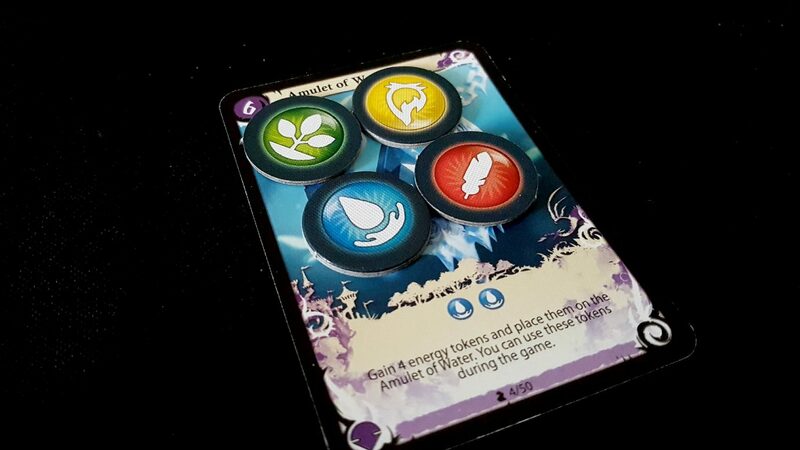 Those two elemental tokens are the currency we can spend to bring a card into play. We spend them to bring forth the ‘Amulet of Water’, which brings with it a pool of four tokens of our choice. So, we turned two tokens into four tokens. That is, as the kids adroitly say, totally wizard. Each card you play is a mark of prestige, and in the end your accumulated prestige is added to the crystals you have acquired to determine your final score. You need to be arranging things so that you’re playing cards down early, and often, and consistently. 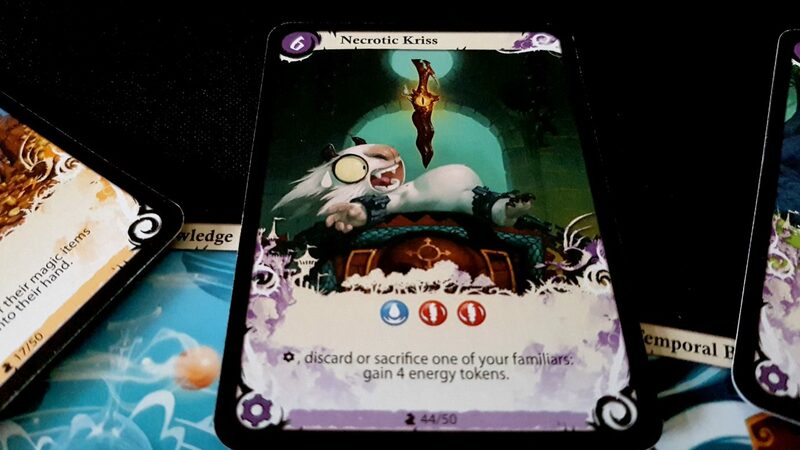 Some cards have no prestige, but still take up the summoning power another card could more profitably use. Some cards have negative prestige, giving short term bonuses at the cost of long-term scoring. The die that’s left after everyone has picked their choice has a tremendously important role. The pips on each die are used to move on the season tracker – the die that’s left determines the tempo of the game. This is a wonderful mechanic – it means that your choice for the die to take is determined not only by what you want, but the optimal way for the year to progress. If you’re in the lead, you might want it to move faster. Or, if you need resources that are abundant in a future season and rare in the current, you might be willing to sacrifice some game length to bring yourself the necessary riches in the next turn. On the other hand, if the current season is good to you or if you’re tailing the pack you might want to eke out the time as much as possible, even if it means picking a sub-optimal die. I love this mechanic so much. 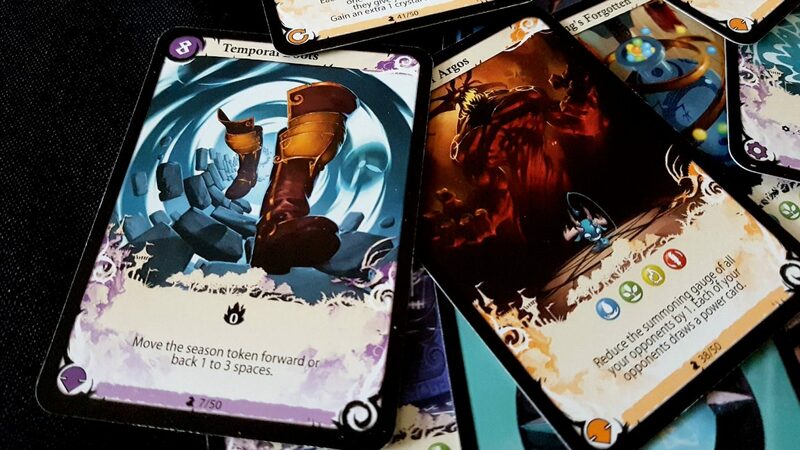 Each turn, we’re doing the same thing – picking a die, executing its associated effects, and then leveraging what we received to turn cards into casting. As your engine ramps up a little, you may find it faltering before you can really pull off the coup-de-grace that will leave your opponents applauding. For those circumstances, you can make use of the bonuses available on the player board – in exchange for a penalty applied at the end of the game, you can gain access to a transmutation, exchange two energy tokens for a different two, gain a point of summoning, or do a card exchange. Be warned though – the cost increases each time, and you can only ever do three over the course of the game. Now you’re going to see some magic! Nice, huh? You get two tokens, and you can store up to ten! I mean, that’s pointless luxury – who could possibly have ten tokens? 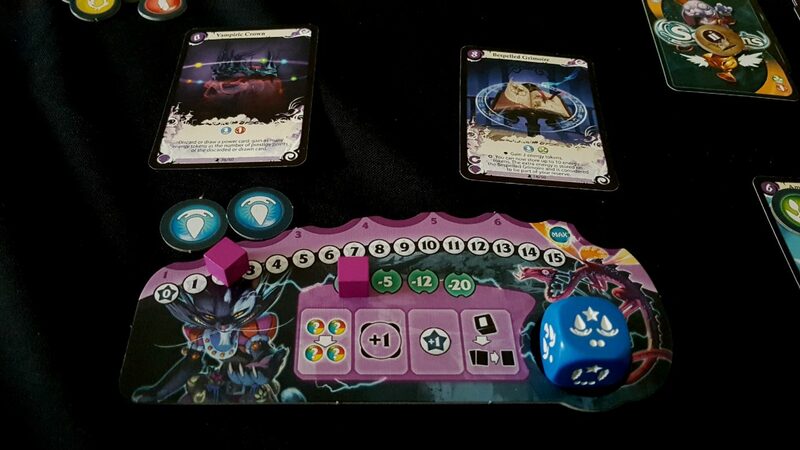 And then look what we can do… the Vampiric Crown lets us draw a card, and get a number of energy tokens equal to the prestige value we revealed. So if we got lucky and draw a high prestige card we might end up with eight or more tokens from that one card play, meaning that that additional token storage suddenly looks very nice indeed. I know, right? It’s an embarrassment of riches, and it means I’m obviously the greatest mage in the world. All hail me, right? Hail me? I only had three cards and I’ve played them all – now I need to hope I can draw new ones on the basis of the dice draft. Accumulated tokens don’t do me any good if I can’t use them, and every die that awards me tokens is now going to end up being wasted. 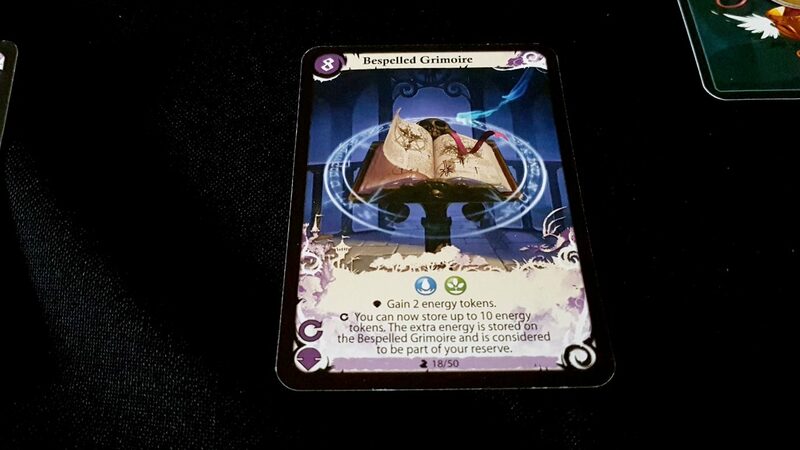 I don’t have the summoning to bring new cards into play even if I do get them, which means either another painful bite at that penalty cherry, or waiting until I can draw a summoning die – and you never get to draw and increase summoning at the same time. I’m not merrily dancing through the seasons now. I’m stumbling. I’m staggering. And potentially it’ll take a year for me to regain my footing. Seasons is a game of momentum and I’ve just lost all of mine. More than that, I’ve made myself a target. There’s any number of cards that will make me regret this massive surplus of tokens I can’t spend. 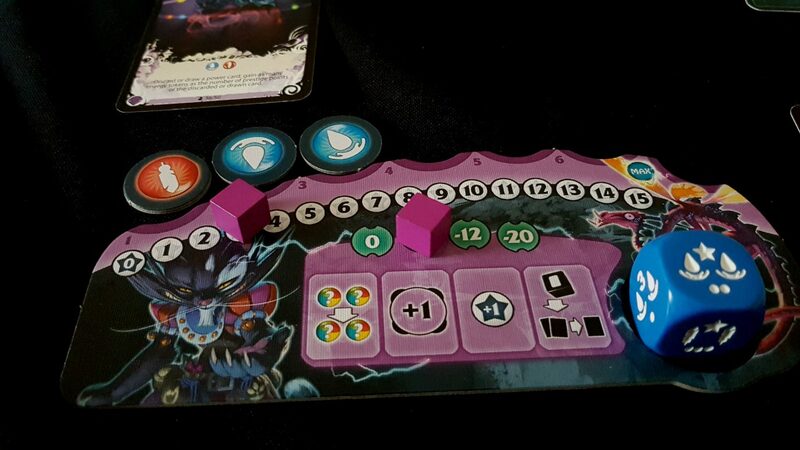 There are cards that can force me to take a magic item back into my hand, losing the resources accumulated on them. There’s a card that gives an opponent an exact copy of all the resources I have in my reserve. Maybe I just handed a cannier opponent the keys to my account at Gringotts. 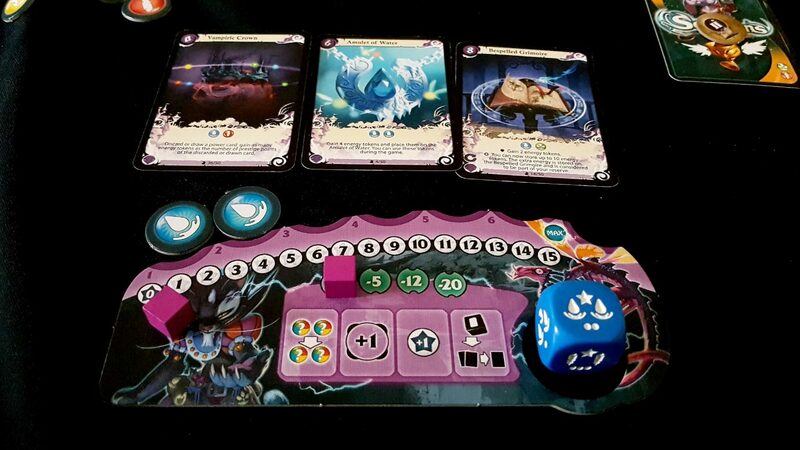 The air elemental turns all of those tokens into air tokens – great if I can transmute in the right season, but a pain to get rid of otherwise. There are risks to being the richest sorcerer in the land, and very few rewards. A wise mage ensures that not only is the current time productive, so too are the times to follow. Grimoires will provide reinvigoration as time goes by, but until then we are stuck with what the dice, and our fellow players, permit us. The tempo of play is all important, and if you mistime your strategy you’ll end up reaping when you should be sowing. 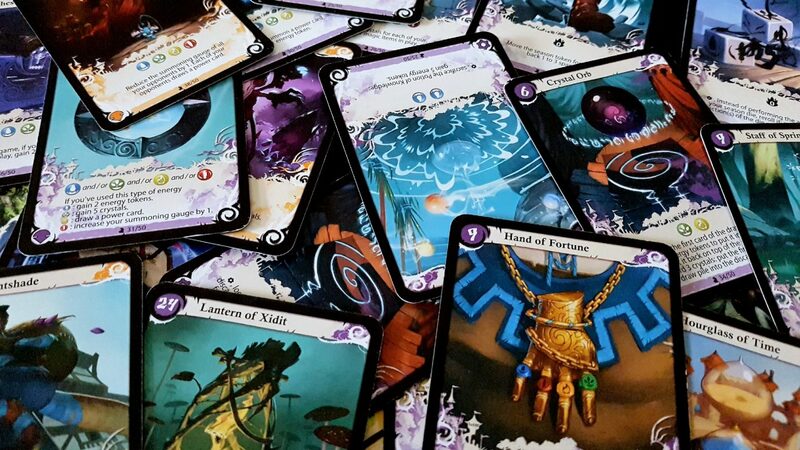 By the end of the game, you’re rich with tokens, full of summoning power, and more interested in getting rid of cards than acquiring them. Each card that remains in your hand at the end of play is a penalty, and so a good player has a plan for drawing cards when it is opportune, and playing them out when it is necessary. To end with no cards in hand, with no more seasons to weather, is the mark of a skilled mage. 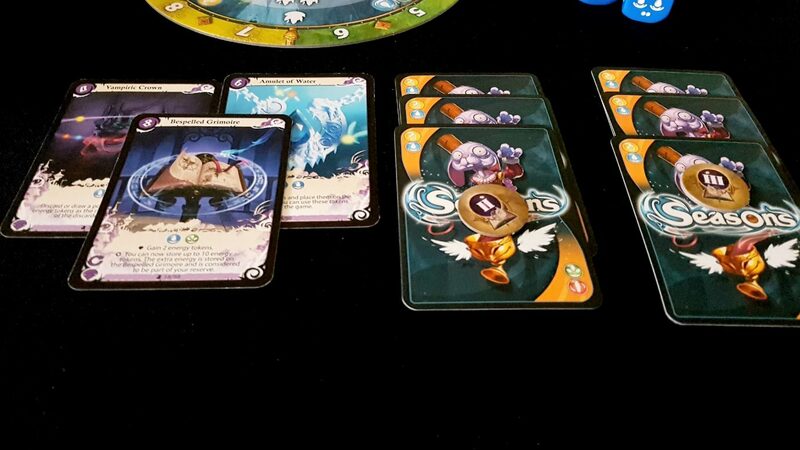 Seasons is a relatively brisk game, with a lovely design full of tightly interconnected systems and subsystems. However, it asks a lot of its players in every single phase of play. First of all, the draft is hugely dependent on an understanding of the tempo of the seasons, and how best to distribute the cards you get across your grimoires. 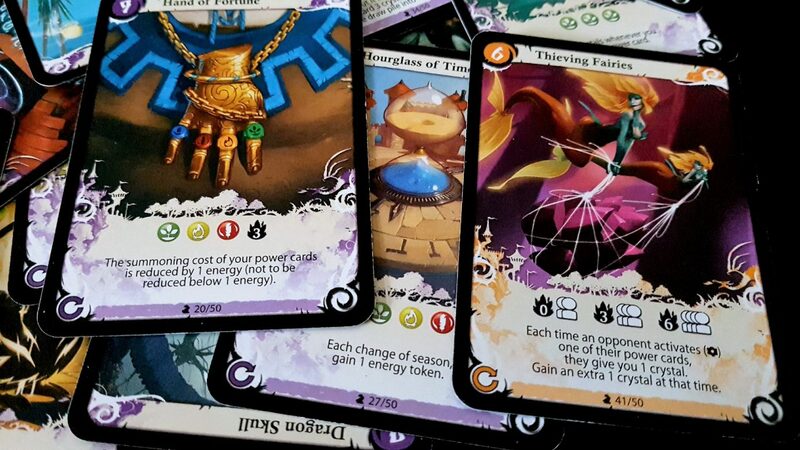 You need a combination of cards, suitable for ramping up in the early stages, maximising efficiency in the second year, and then doubling down on the acquisition of crystals. Some cards are best played early to reap maximum benefit, others best played late to take advantage of contextual game intelligence. Some cards are useless in isolation, but very powerful in combination, and some have a synergy that is decoupled from temporality. You really need to understand how the cards interact if you want to stand a chance of winning. While the game does offer opportunities for drawing later cards, you don’t recover easily from a sub-optimal draft. 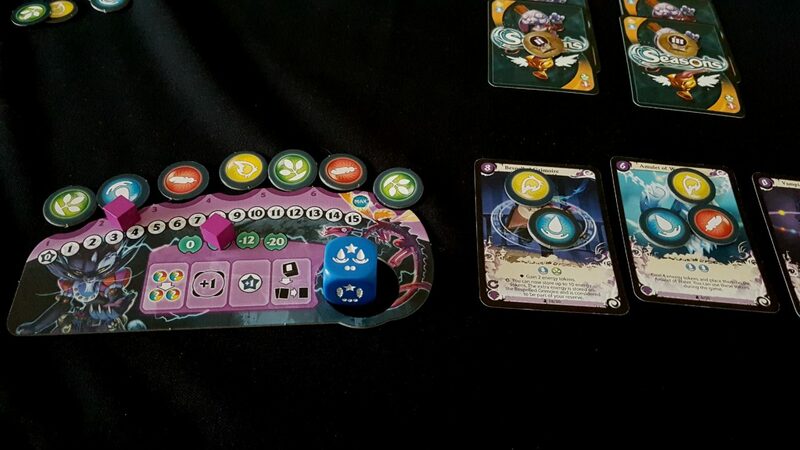 Similarly, there is an asymmetrical distribution of resources within the different seasons of the game and you want your cards to synergise with the availability of the elements. Right out of the gate, Seasons is asking you to bring your A-game. And those decks – you’ll know some of the cards floating around in the hands of other players, but you’ll never know for sure what they’re expecting to build, or what’s coming up from unseen hands. Even if you know how to construct your eldritch engine, you might not find the parts are available. You may find yourself committing to a course of action that’s doomed to failure from the start. That’s solid risk versus reward stuff there, but again – cruel as winter. There’s only so far the draft will take you when it comes to enabling the kind of synergies that yield the most impressive results in play. And then, it doesn’t let up. Right from the first round of the game, you’re expected to be able to match your play with the rhythm of the passing seasons. 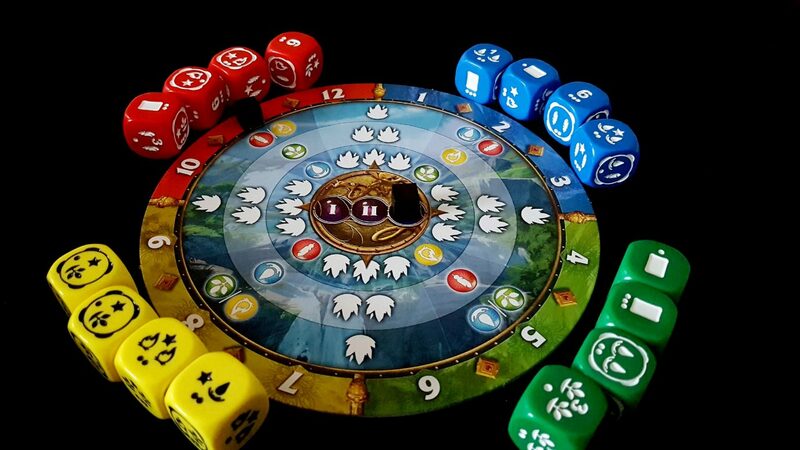 The nature of dice drafting means that game length, and season length, is highly variable. Manipulating this effectively is a key strategic concern that also has tactical importance – different resources are abundant in different seasons, and you don’t want to stay too long in those seasons that don’t yield the raw materials you need. On the other hand, you don’t want to race too quickly to the next year because you need to invest in engine building. Knowing when to brake and when to accelerate is important to matching your opportunities to the pace of play. It’s very easy to stumble here, and by the time you recover you might find a year of play time has passed without you accomplishing much of anything. That’s a rich, deep and fascinating game mechanic but one that is intolerant of careless play. The temporality of seasonal availability is something that you need to master to play well. And then you need to be watching everyone else to know what they’re up to, and when you’re likely to get the resources you want. You need to understand on an intuitive level the way the seasons interface with the cards you suspect your opponents have in their hands. You can deny them what they need if you’re careful, if you’re clever. They can do the same to you though, so you also need to mask your intentions if you’re going to achieve what you want from the dice draft. All of this is why Seasons is such an excitingly rich game. It’s one though for whom appreciation can take time to mature. Your first few turns will be like learning to drive a manual transmission – crunching, grinding, juddering, and the occasional dead pedestrian. Everything will clunk with such peculiar indifference of your efforts you will likely find yourself utterly bewildered and despairing. The next game will go more smoothly – you’ll understand the draft a little better, and the leverage over temporality offered by the dice. You’ll see some of the synergies, and set up some combos of your own that bring a grin of pride to your face. Before you know it, you’ll be chopping down mountains with the edge of your hand with breathless ease, manipulating the river of time for your own nefarious purposes, and having a blast doing it. Seasons is a very good game. Ironically though for a game that is about the sedate scale of solemn sorcery it’s got zero tolerance for time-wasters. Bear that in mind if you fancy picking it up.